Child Fare 3-8 years old: $50 USD per person. Includes: transportation, guide, snorkeling equipment, lunch or dinner. Come aboard and see the many dolphins, whales, sea turtles, and birds of the Manuel Antonio Marine Preserve. The tour includes snorkeling equipment and a tour of the offshore islands . We also stop for a leisurely swim at one of the white sand beaches and dive on the underwater reefs of the Manuel Antonio Marine Preserve. Enjoy a feast of fresh fruits, grilled fish brochettes, pasta salad, drinks and the finest hospitality. Come aboard as we cruise into the open sea in search of spotted dolphins, migrating humpback whales, sea turtles and manta rays. As we make our way down the coastline of Manuel Antonio National Park, experience the mysterious islands, jagged cliffs & unique rock formations, these are the nesting grounds & home for numerous species of marine birds, including magnificent frigates, pelicans, yellow footed boobies & white ibises. While touring the coastline, the captain will hoist the sails(wind permitting) and you will enjoy the feel of the catamaran cutting quietly through the blue waters of the Pacific. Our guides will be ready to answer any questions you have while giving a brief history of the area. After touring the coastline, we will anchor in a protected cove within the pristine Biesanz Bay for a snorkeling adventure in the warm Pacific waters. 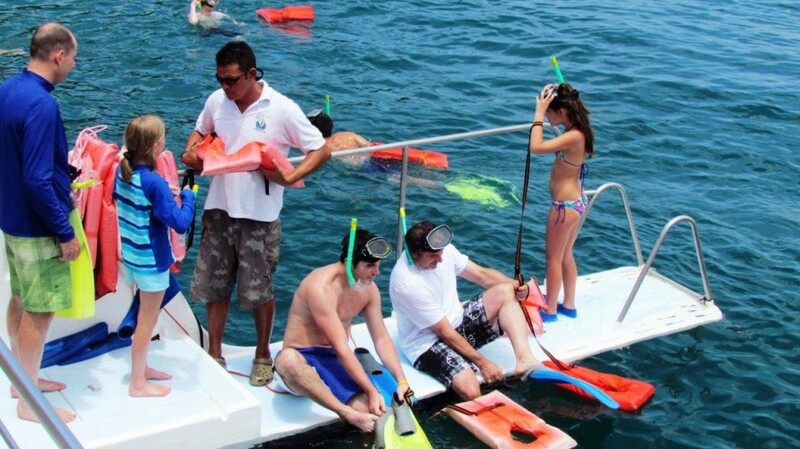 We provide the masks, snorkels and fins, everything you need to dive in and observe the underwater playground for numerous species of colorful tropical fish. Afterwards come back on board and enjoy the delicious lunch we will have prepared for you. You will discover the true meaning of the word paradise as you relax & enjoy the Pura Vida in this beautiful bay surrounded by the lush green landscape and the soothing sounds of the ocean. The viewing of one of our dramatic sunsets on the way back to shore is an added bonus for those who enjoy our afternoon tour in the summer months. You will spend 4 hours aboard our ship, but the memories will last a lifetime.